The Setting: This was our first time filming at Delta Diamond Farm in Isleton and we instantly fell in love with this place! From the cute cottages where the bride can get ready to the rustic barn that provides a beautiful backdrop for the reception – this place has everything. And we mean everything – including a cute gas station that reminded me of something you’d see at Cars Land at California Adventure. There were so many different locations for photos and there was such an attention to detail everywhere you looked. We would definitely highly recommend this place! Go Team! 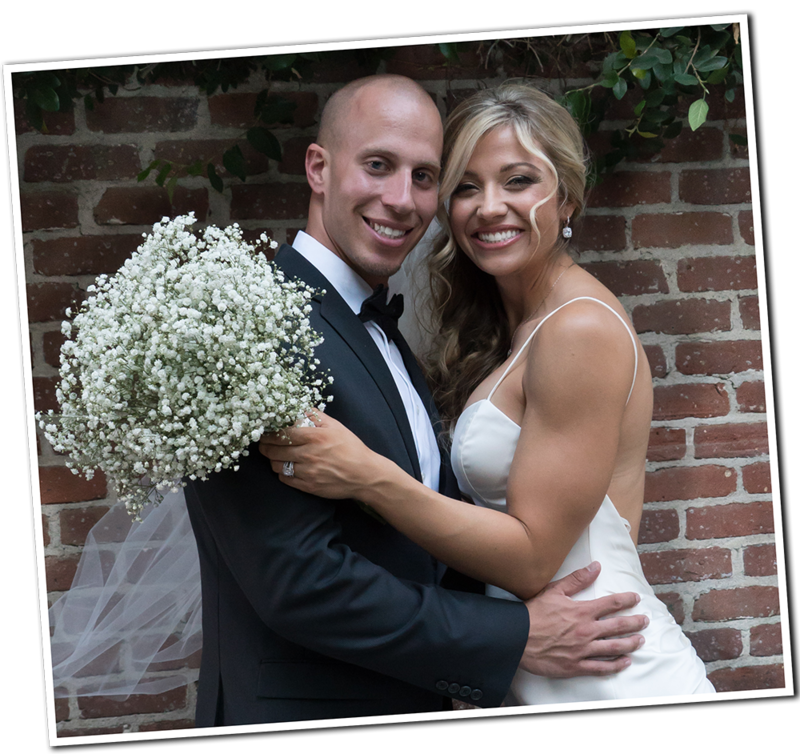 : Stephanie and Jon met and fell in love while studying at USC. Their love for the school and their football team was front and center throughout the wedding – from USC props for their bridal party photos to a garter-wrapped football that Jon tossed during the reception. Great Idea: Stephanie set up a little display at the reception to pay tribute to the “bouquet toss that started it all!” She was the lucky recipient of the bouquet at her friend’s wedding and she even had the dried bouquet on display at her wedding. How cool! The Couple: We didn’t get an opportunity to get to know this couple ahead of time as they were a last minute booking for us. But what we can say for sure is that these two definitely had a blast at their wedding! Jennifer had a perma-smile the whole day. Filming their photo shoot was so much fun because these two needed no direction from their photographer – their excitement and love for each other was so evident and we were just there to witness the moment instead of directing it. How cool! What a team! : If you want to be pampered on your wedding day, you must hire the team of vendors that we worked with last night. Rebecca and Barry from Ford Family Photography (www.fordfamilyphotography.com) really go the extra mile to make the day a success. Barry is too cute constantly making sure that the couple is hydrated and cool while Rebecca’s calmness and expertise give us plenty of awesome footage to work with. 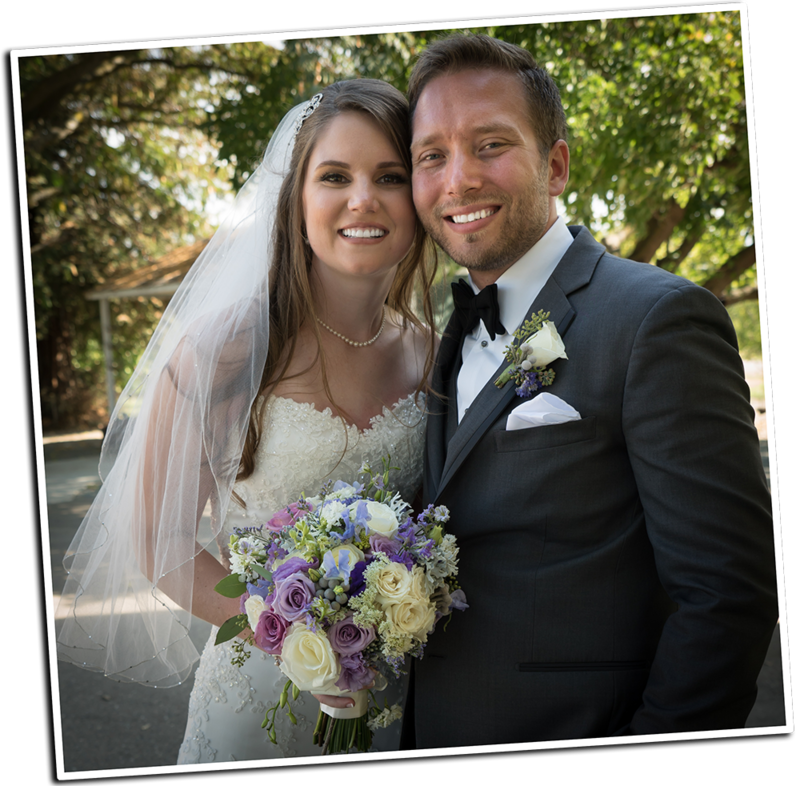 Christina and her team from Catta Verdera always make sure that the wedding goes off without a hitch and one of the cool things they do is make sure that the couple gets to sneak into the ballroom for a room reveal before the guests enter for dinner. Not all venues arrange that and not all photographers are open to giving up a little of their photography time so the couple can get a sneak peek at their vision realized. Finally Steve with Function 45 (www.sacramentoweddingdj.com) is always a pleasure to work with. He is so creative and can get guests up and out of their seats like no other. Great Idea: Don’t know if the idea was Steve’s or Jennifer’s but one of the fun things they did was have a “selfie dance” where guests could come up and take a selfie with Jennifer. It’s something that guests are clamoring to do anyway, so why not embrace it and have fun with it! The Setting: Courtyard D’ORO provides such a beautiful backdrop for a wedding. Nestled among Old Sacramento’s historic buildings, the tree-lined courtyard is gorgeous and very private. 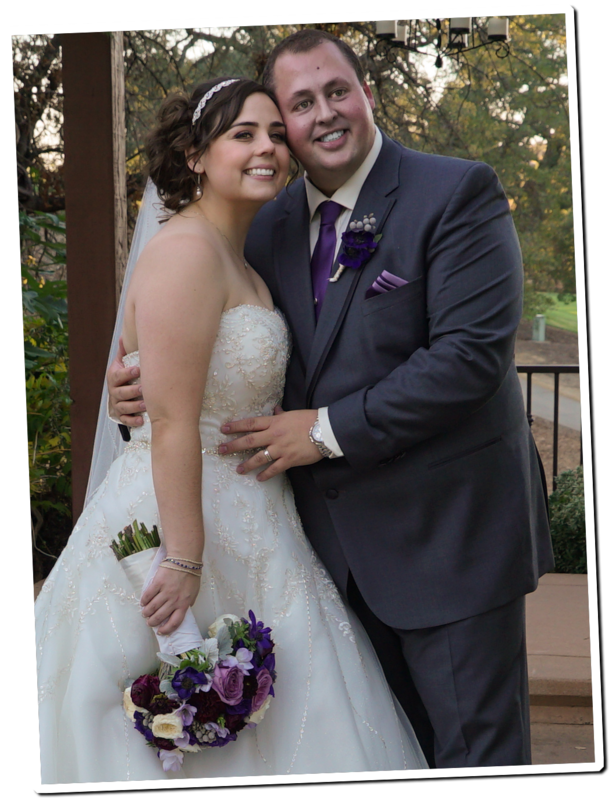 Following the garden ceremony, guests were welcomed inside the newly remodeled banquet room that was perfect for Amanda and Ryan’s elegant reception. Yum! : In lieu of a traditional cake, Amanda and Ryan set up a dessert station featuring some of the yummiest cookies we’ve had a in a while! It’s so great when couples think outside the box and don’t just go for what’s traditional! Too funny: One of the funniest moments of the wedding actually happened to US as we were setting up our gear before the wedding. Out of nowhere, a praying mantis starts climbing up Cael’s shirt. We must have been a sight to be seen as Cael was screaming, “Get it off me!” and I was trying to bat it off without hurting it. Supposedly they are good luck and luckily that situation didn’t happen during the ceremony! 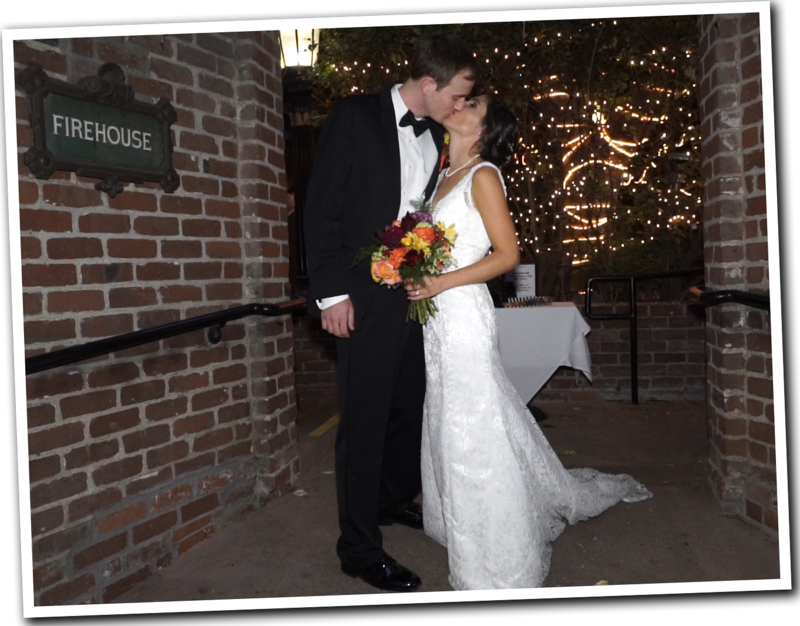 The Couple: Los Angeles residents Caity and Chris travelled back to Caity’s hometown for their garden wedding at the beautiful Firehouse Restaurant. After meeting and falling in love while attending UC Berkeley (Go Bears! ), Caity followed Chris to Southern California as they pursued job opportunities. The English degrees they earned at Cal paid off big time for them as they wrote what many would argue as the most important text of their lives — their personal vows to one another. Their wasn’t a dry eye in the place as Caity and Chris poured their hearts out to one another! Getting the Party Started: There are many aspects of a wedding that are video worthy – where just a photo will not suffice. At this wedding it was the Father-Daughter dance. Not only did Caity and her dad wow the crowd with a non-traditional dance, their high energy routine got everyone out of their chairs and onto the dance floor to kick the party off right! Now that’s how to get a party started!